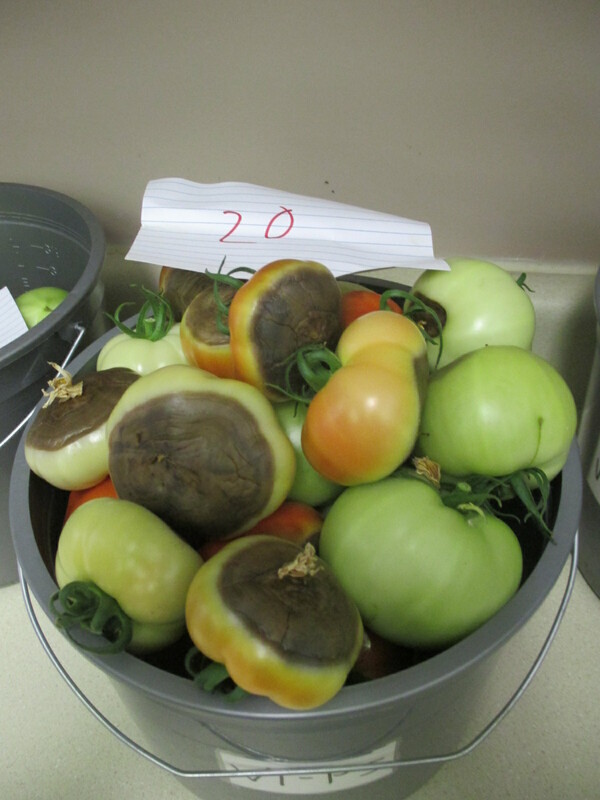 In the past few weeks, we have received several reports about blossom end rot on tomatoes and peppers as the crops start to set fruit. 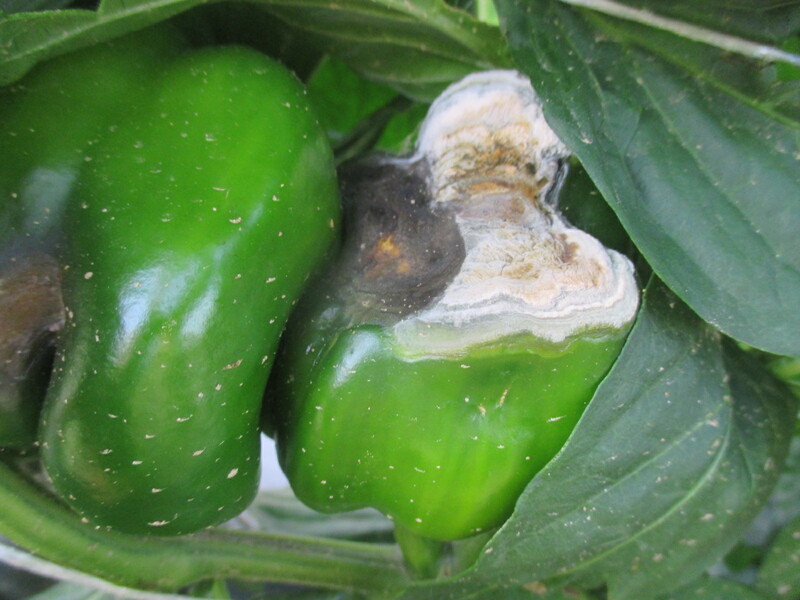 Blossom end rot is a physiological disorder (not an infectious disease) that commonly occurs on tomatoes and peppers. Initial symptoms of the physiological disorder include dark green or brown water-soaked leisure occurring on the bottom of the fruit (Figure 1). Figure 1. Initial symptom of blossom end rot on a pepper. The lesion then expands into sunken, leathery brown or black spots (Figure 2 and 3). In severe cases, the lesion can expand to half size of the fruit. The symptoms on tomatoes can be observed on fruit from fruit set to fruit the size of golf balls. Fruit on the same cluster tend to show symptoms simultaneously. On peppers, the symptoms are more likely appear during fruit expansion. The affected fruit often change color prematurely. Under moist conditions, opportunistic molds might develop on the affected tissues (Figure 4). Blossom end rot more often appears on the early setting fruit than fruit develop later in the season. Figure 3. Blossom end rot of tomato. Blossom end rot is caused by a calcium deficiency at the bottom of the fruit. Low concentration of calcium in soil solution might contribute to the problem. In addition, factors that inhibit calcium uptake and prevent enough calcium from moving to the fruit can also cause symptoms. We often see blossom end rot occur on hot and sunny days. Two reasons explain this trend. First, water stress. Calcium must be moved to the fruit with water, if there is not enough water, it is hard for calcium to reach the bottom of tomato fruit, the furthest end from where water is taken. Another reason is that fruit are fast expanding under hot and sunny days. The supply of calcium may not be able to catch up the rate of fruit expansion. If the plant is not provided with enough water, particularly during fruit set and expansion, blossom end rot may become a problem. We also see the symptom occurs in high salinity soils. This is also related to water stress as high salt content in soil prevents plant water uptake. Unbalanced nutrient supply may cause blossom end rot as well. 9Since calcium, magnesium, potassium, and ammonium-nitrogen are all positively charged. Calcium update might be inhibited by oversupply of other cations (positively charged ions) in the soil. Conduct soil tests and apply preplant fertilizers accordingly is very important to provide crops with a balanced nutrient supply, the first step to prevent the occurrence of blossom end rot. During the production season, doing plant tissue tests in the early season can help detecting potential calcium deficiency. Applying calcium through drip system can effectively correct the problem. Another important step to prevent blossom end rot is water management. Be sure crops are not suffering water stress particularly during fruit set and expansion. If blossom end rot shows on the developing fruit, there is no way to correct the problem on the affected fruit, and they lose marketable value. Growers often ask whether foliar sprays of calcium can help correct calcium deficiency in developing fruit. There is not a conclusive answer from scientific research. Theoretically, since calcium moves in the plant with water flow via the xylem, it is not likely calcium taken up by the leaves can move to developing fruit. When tomato fruit reach golf ball size, they have already developed a waxy outer layer that is almost impermeable to water. Therefore, it is also not likely that calcium can enter the fruit directly if they have started to expand.